The game is simple, use your paddle to dodge or shoot the Frowns and pick up the Smiles. The game features a variety of unique power-ups/power-downs, abilities and game mechanics, as well as an entire leveling system, providing extreme customization. Amazing Paddle also uses the power of Game Center for its multiplayer, online leaderboards and achievements. -Collect Paddle Points and use them in the Paddle Store to earn new paddles! -Pick up a variety of power-ups/power-downs! 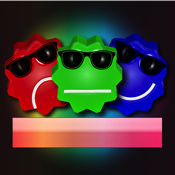 -Compete on Game Center for the highest scores! -Give your paddle a name and keep track of its level and progress! -Unlock special perks/skills for your paddle! -Challenge other players from around the world using Game Center! 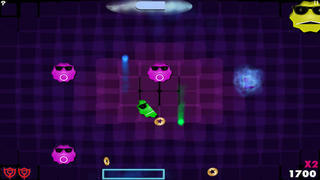 -Encounter enemy paddles as you play! -Keep track of high scores and wins! -Earn a variety of unique achievements! The objective of the game is to score as many points as you can without getting hit by a Frown, Enemy Paddle or any other type of harmful object. To score points, you need to pick up the Smiles using your paddle. Tilting your device will allow you to move your paddle; you can also tap the screen to shoot. Shooting the Power-Up Carrier (The Green Guy) will cause a random power-up to drop that you can pick up to help you survive. Shooting the Power-Down Carrier (The Dark Guy) will cause a random power-down to drop that will harm you if picked up. You can also shoot the Frowns, Smiles and Enemy Paddle to destroy them. Collect Paddle Points whenever possible to increase your paddle’s progress. After you lose all of your lives, your paddle will fall and it’s Game Over. Each game you will earn Paddle Points and experience which you can use in the store to unlock new paddles and features.